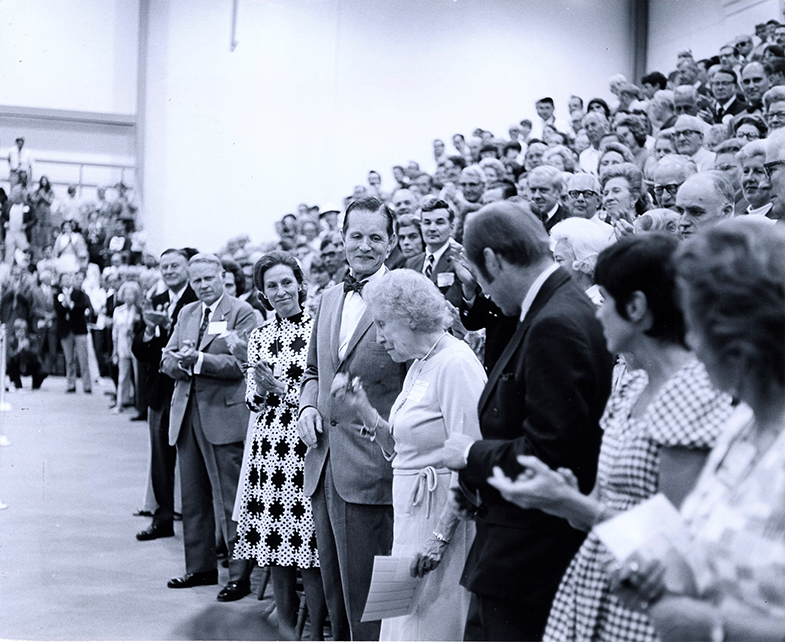 Walker Kirby, left, with husband Fred M. Kirby II ’42, mother-in-law Marian Kirby, and brother-in-law Allan P. Kirby Jr. at the dedication of Kirby Field House. The Lafayette family mourns the loss of Walker Dillard Kirby, spouse of Fred M. Kirby II ’42, mother to Fred M. Kirby III ’80, S. Dillard Kirby ’81, and Jefferson W. Kirby ’84, and grandmother to Elizabeth Kirby ’13 and Jane Kirby ’19. She died at age 93 on Nov. 11. The relationship to the Kirby family spans a century, beginning in 1911, when Allan Kirby enrolled at the College as a first-year student. Although Allan attended Lafayette for only one semester, F.M. Kirby I began a lifelong affiliation with the College, becoming a trustee in 1916 and serving on the board until his death in 1940. Allan’s commitment to Lafayette also lasted all his life. He served as president of the Alumni Association for two terms (1929-1931) and was elected a lifetime trustee in 1937. The family’s generous support is evident on campus in the Fred Morgan Kirby Professorship in Civil Rights, Kirby Hall of Civil Rights, Kirby House student residence, Allan P. Kirby Sports Center, and the renovation of Fisher Stadium. Both Walker and Fred M. Kirby II were avid riders. So it seems appropriate that their first date was on horseback. They married on April 30, 1949, and soon made a home in New Jersey. There she dedicated her life to their children and many volunteer organizations. Most notable was her support of The Seeing Eye, a guide dog training facility in Morristown, N.J. She was a 30-year board member and received the prestigious Dorothy Harrison Eustis Humanitarian Award in 1991, only the third time the award has been given by the organization. There she created Walkie’s Walkers, a volunteer program to walk, play with, and exercise the dogs as a break from their rigorous training. This week as the College celebrates the 153rd meeting of the historic Lafayette-Lehigh football rivalry, there will be one fewer fan in the stands. Walker Kirby cheered on Lafayette football for nearly 60 years, attending games with Fred, who had played for Lafayette.